David Hernández recently received a trio of prestigious research awards. University of Notre Dame Assistant Professor David Hernández recently received a trio of research awards: a fellowship from the American Council of Learned Societies (ACLS), a Career Enhancement Fellowship from the Woodrow Wilson National Fellowship Foundation, and a fellowship from Harvard’s Loeb Classical Library Foundation. “I am honored and thrilled to receive this tremendous help for my research,” says Hernández, who is a faculty member in both the Department of Classics and the Department of Anthropology. This research support, he says, will enable him to publish the findings from a spectacular archeological site in Butrint, Albania, that he has studied since 2004. The site, recognized by UNESCO as a World Heritage Site, has yielded archeological treasures and architectural insights from successive settlements, most notably Greek and Roman, which date from the 7th century B.C. 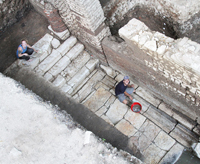 to the 7th century A.D.
Hernández and his team have uncovered the architectural footprints of a Roman forum—a monumental town square built 2,000 years ago—and a 38-columned stoa thought to have served as a Greek civic center. Among hundreds of artifacts discovered at Butrint are a life-sized Roman statue, ceramic figurines—one of a female reveler of Bacchus, the other of a Greek goddess—and a wooden plough from the 4th century B.C. Forum pavement and the Roman Basilica discovered at Butrint, Albania. The fellowship award from Harvard’s Loeb Classical Library Foundation is among the most prestigious in the field of Classical Archaeology. All three grants underscore the importance and quality of Hernández’ work, according to Ken Garcia, associate director for the Institute for Scholarship in the Liberal Arts. Garcia, who oversees grants awarded to faculty members in the College of Arts and Letters, notes that the competition for each of these fellowships is fierce. The ACLS, for example, received 1,121 fellowship applications nationwide and made only 65 awards—a success rate of only 5.8 percent. 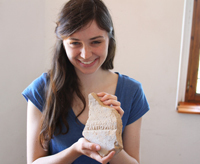 Notre Dame undergraduate Kaitlyn Farrell with a tile stamped in ancient Greek, one of the many finds from the Butrint excavation. After he returns from the final excavation season in Butrint this summer, Hernández will use his fellowships to take an 18-month sabbatical during which he will focus full-time on a two-volume publication of the excavation findings, tentatively titled The Discovery and Excavation of the Roman Forum at Butrint: Urbanism in Ancient Epirus From the 7th Century B.C. to the 7th Century A.D. The book will also explore “the formation of the Butrint headland, the creation of the urban center there, and eventually its monumentalization during the Roman Empire and the breakdown of urbanism,” Hernández says. In a second, edited volume, Hernández plans to examine the specialized analyses that have taken place at the site, including studies of its ancient glass, archaeobotany, archaeozoology, ceramics, sculpture, coins, and inscriptions. 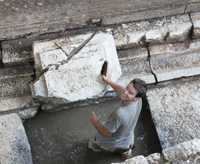 Hernández has already made it a point to share his expertise with Arts and Letters student researchers during the summer excavation seasons in Butrint. By the end of the final trip this summer, he will have introduced more than two dozen undergraduate students (most from Notre Dame) and 16 graduate students to the site. Arts and Letters students Michael Kipp and Mattimore Cooper excavating burials at the Butrint World Heritage Site in Albania. 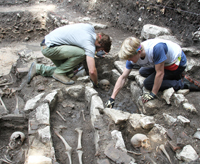 Not merely observers, the students actively engage in excavating and processing finds. “I consider the undergraduates as team members,” Hernández says. Four Arts and Letters students returning to Albania this summer are Mattimore Cronin, Kaitlyn Farrell, Matthew Wieck and Suzanna Pratt. Wieck, a Classics major, is looking forward to his third season in the trenches, having now become one of the most experienced undergraduate students in archaeological field methods. 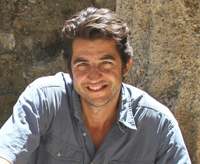 In any discussion of his work at Butrint, Hernández is quick to credit the many other scholars and researchers involved as well as the funding entities that have made the project possible. The Albanian Institute of Archaeology’s Dhimiter Condi is a co-director of the project. Funding has come from Notre Dame, the American Philosophical Society, and the Butrint Foundation. At the University, key supporters include the Office of the Vice President for Research, the College of Arts and Letters, and the Department of Classics. The Institute for Scholarship in the Liberal Arts also helped underwrite Hernández’ research—and covered all student expenses including transportation. Originally published by Mark Shuman at al.nd.edu on April 16, 2013.